LSU And Alabama's Defenses Seen Deciding BCS Title : The Two-Way The consensus seems to be that tonight's BCS championship game between No. 2 Alabama and No. 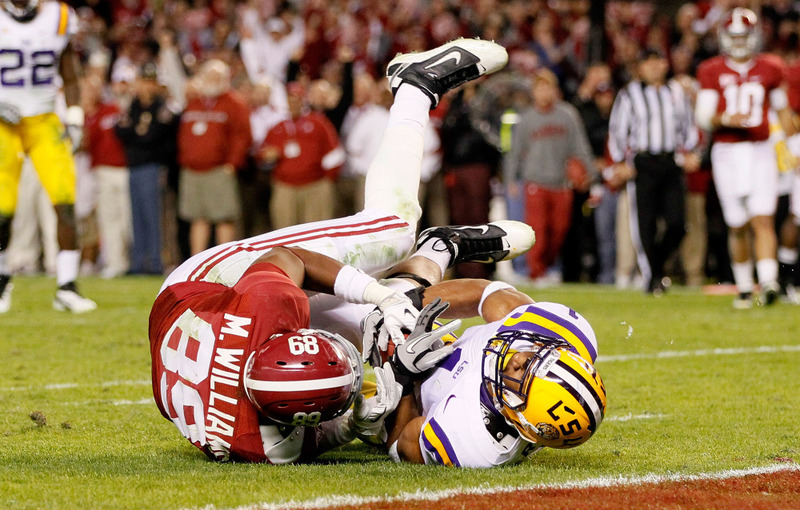 1 LSU will be a defensive struggle, similar to the touchdown-free game they played on Nov. 5. But while they field elite defenses, LSU and Alabama's squads have very different strengths. Not Giving An Inch: You can expect to see lots of close contact in Monday's BCS national title game. Here, Eric Reid of the LSU Tigers defends against Michael Williams of the Alabama Crimson Tide. The consensus among college football's fans and analysts seems to be that tonight's BCS championship game between No. 2 Alabama and No. 1 LSU will be a defensive struggle, similar to the touchdown-free game the two teams played on Nov. 5, when LSU won in overtime, 9-6. "These are the two top defenses in the country," NPR's Tom Goldman told David Greene on today's Morning Edition. "Alabama allows under 9 points a game; LSU is right behind, allowing only 10.5 points a game." Goldman sympathizes with anyone for whom a replay of that November game sounds boring, saying, "if you like scoring, like most people do, it was a downer." The kickoff for tonight's game is set for 8:30 p.m. ET; it is being televised by ESPN. And as Tom notes, LSU head coach Les Miles has promised the title game won't resemble the high-scoring track meets that have marked the 2011 bowl season. Instead, Miles says, fans should expect to see "big-boy football" — in which, we presume, two balanced teams conduct trench warfare on the line of scrimmage, and no receivers are unaccounted for. So, you'll see two elite defenses tonight, each with some names you'll likely hear called early in the NFL draft (you'll watch all of that, right?). But that doesn't mean the two squads are the same. Alabama is committed to stopping the run — but with a three-man front. And they do it with size. Consider that when he went to the NFL, former Alabama nosetackle Terrence Cody found that he had to lose weight, from the 370 pounds-and-up that he used to anchor the Crimson Tide's run defense down to a more manageable 335 pounds (?!). This year, Alabama's defensive line is anchored by three players — Damon Square, Josh Chapman, and Jesse Williams — who weigh a combined 914 pounds. But as ESPN sports science analyst John Brenkus says, the three will give up a weight advantage to LSU's offensive line, which averages 315 pounds per man. But Brenkus says that Messrs. Square, Chapman and Williams have a good shot at controlling their opponents, because weight isn't the players' only strength — they also deploy their weight with low centers of gravity. On average, Alabama's defensive linemen are two inches shorter than their opponents from LSU. And that gives them a better chance to use leverage to control the line. And while LSU's secondary gets many accolades — after all, it does include Heisman runner-up Tyrann Mathieu — Alabama held LSU to 91 passing yards on Nov. 5, while Crimson Tide quarterback AJ McCarron threw for 199. LSU's Secondary: On Par With The NFL? For LSU, the secondary has been a real strength, and a weapon. Brenkus praises Morris Claiborne, Brandon Taylor, Eric Reid and Tyrann Mathieu for being both exceptionally fast — each of the four athletes has "reportedly clocked faster 40s than the average times for cornerbacks and safeties in the NFL," he says — and for being incredibly agile. "Analysis reveals that all four starters are able to change directions in only two-thirds of a second," Brenkus says, "as quickly as the [New England] Patriots' first-round draft pick, and Pro Bowler, Devin McCourty." Those two statistics, taken together, mean that the Tigers' secondary can reliably cover a huge amount of ground — essentially a halo of 13-15 yards in any direction around them, Brenkus says. He estimates that within two seconds of the ball being snapped, "assuming their coverage doesn't overlap, they can theoretically cover about 2300 square yards — almost 45 percent of the entire field. That kind of speed allows LSU to focus on the line of scrimmage, playing a 4-3 scheme that sics defensive ends Sam Montgomery and Barkevious Mingo on opposing quarterbacks. With these top-flight defenses threatening to make it tough for either team to build a lead, the kicking game could decide the national title, just as it decided LSU and Alabama's earlier game. In that game, LSU was three for three on field goal tries, while Alabama missed three out of the six it attempted, along with having a 49-yard attempt blocked. And while LSU's punter, Brad Wing, was busy in the November game, coming on for six kicks, he put four of those punts inside Alabama's 20 yard-line; his long of the day went for 73 yards. For Alabama, Cody Mandell only punted twice — and both of his kicks also landed inside the 20. Much was said about Alabama's inability to hit field goals in that game. But none of the team's misses, by kickers Cade Foster and Jeremy Shelley, were from less than 44 yards out. And Foster tells The Birmingham Times that he felt "pure joy" when he learned he'd have another chance to beat LSU. Jordan Jefferson is now LSU's entrenched starter, replacing Jarrett Lee. Jefferson can throw, but he also allows the Tigers to run the option — an attack Georgia Southern used to rack up 302 rushing yards against Alabama. Two players who were barely involved in the Nov. 5 game — Alabama tight end Brad Smelley and LSU running back Kenny Hilliard — emerged as scoring threats late in the season. The best way to defuse a powerful offense is to keep them off the field — and that means LSU might see far more of Alabama's Heisman finalist, Trent Richardson, in this game. The running back had 89 rushing yards, and 80 more in the passing game. He's capable of much more. Of course, there's also a good chance that the two teams will find a way to score more points in the BCS title game than they did in November. And their defenses might even get in on the act and add some points of their own, if they can induce any juicy turnovers. Whatever happens Monday night, there are signs the BCS might once again shake up its method of determining a national champion. This year, the system has come under fire for setting an LSU-Alabama rematch instead of giving No. 3 Oklahoma State, champs of the Big 12, a shot at unseating LSU. "As there is a joke about the Holy Roman Empire — that it was neither holy, nor Roman, nor an empire — so can the same be said about the Bowl Championship Series. It's not a bowl; it's a game played in the Superdome. It's not a championship, just an exhibition, because the teams have been appointed to show up without earning the right to challenge for the title. And it's not a series, because no team plays more than once." As the AP reports, BCS officials are gathering later this week to discuss ways to improve the system. One idea that will likely come up again is the "plus one" model, in which the top four BCS-ranked teams would play what's essentially a seeded mini-tournament. At the cost of adding one more game to college football's post-season schedule, the BCS would then have a semifinal round (played in the existing BCS bowls). And then the winners would play each other for the national title, one week later. At least one fan of that proposed system is someone who's benefiting from its absence this year: Alabama head coach Nick Saban. "I just feel that only having two teams sort of takes a lot of teams out of it," the AP quotes Saban as saying during media day in New Orleans.